The oldest wine-making site discovered anywhere in the world thus far is in the Kvemo Kartli region of southeast Georgia, where clay vessels containing grape seeds and vine dust, dated to about 6,000 BCE, have been unearthed. 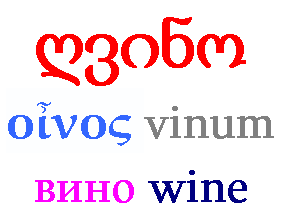 It is probable, therefore, that it was Georgian, neither an Indo-European nor a Semitic language, that gave the world wine and a word for it, both of which spread in tandem. (1) Wine and its manufacture traveled from the Caucasus to southern Europe and the eastern Mediterranean basin at roughly the same time, so that oinos and yayin are independently descended from an ancient form of modern Georgian ghvino (ღვინო), either directly or through other, mediating languages. (2) Wine reached southern Europe from the Caucasus first and traveled from there to the eastern Mediterranean, so that yayin may descend from oinos. (3) Wine reached the eastern Mediterranean from the Caucasus first and traveled from there to southern Europe, so that oinos may indeed descend from yayin. To the best of my knowledge, all of this remains an open question. Perhaps it will eventually be settled by the linguists and archaeologists, perhaps not. There’s really no rush to find out. Whether you would rather wash down your steak with a Greek agiorgitiko or an Israeli cabernet sauvignon doesn’t have much to do with it.